You need this bikini in your life. It's one of our favorites of the season, with a lux texture and ring front details it is the perfect bikini top to wear from the sand to the surf and back again. Tee it up with the matching bottoms! Stay shaded in style with the Jenny Hat! 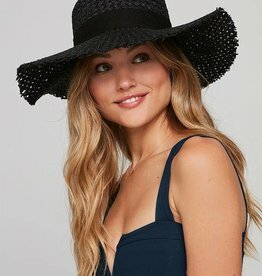 This boater-style beach hat features frayed edges and a ribbon trim. Sometimes simple is sexier. The Olivia Top is a clean and sleek bralette-style top with a v-neckline and supportive banding to highlight and flatter the chest. Features adjustable over-the-shoulder straps, removable pads, and cut-out back detailing. The swim keeps coming! 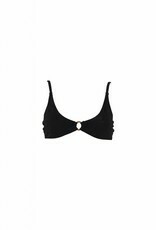 The perfect match to the Loren Ring Bralette top!